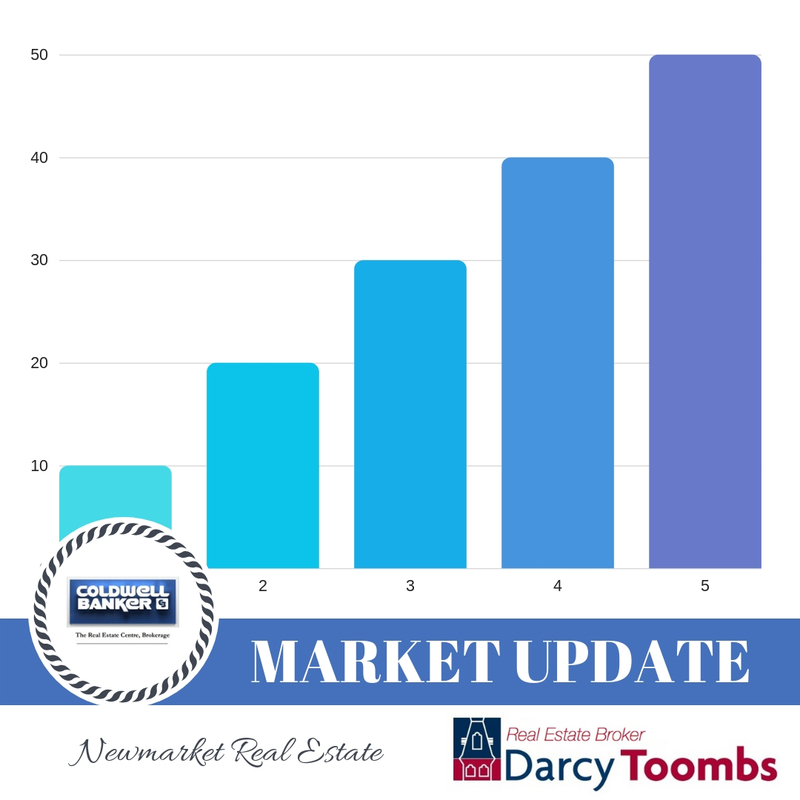 Quick update for what is happening in the Newmarket Real Estate market. February has been a busy month for sales in Newmarket, which is a very promising sign of things to come this spring. So far there have been 36 sales as of the mid way point in the month and there is already 26 listings showing a SOLD Conditionally (SC) status. The other promising sign is that the number of active listings is also down to 273 compared to February 2018 when there were 343 active listings. 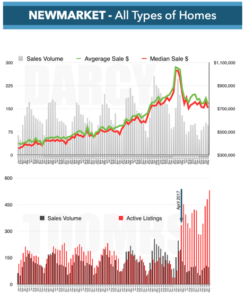 If the sales figures for the month continue and double for the whole month and active listings remain steady, we would see a sales/active listings ratio of 26.4% compared to a sales/active listings ration of 23.52% in February 2018. While this is not a large difference in the ratio, it’s a solid data point for February. The average price on sales for the month is currently sitting @ $712,336 and Median sale price of $704,500. This figures are down, but the average list price of the 26 properties with a SC status is currently $909,081… so I expect the average sale price to increase a fair bit by the end of the month. There is some discussions whirling around about the government relaxing some elements of the ‘stress test’ and allowing for longer amortization, which will help buyers get into the market! As long as the number of active listings stays below 300 I will feel confident that the market will remain strong. 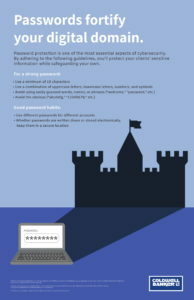 Tips to Buyers: Don’t hesitate to try an offer! Tips for Sellers: Don’t be too stubborn on your price. Get it sold and move on. The month of Ghosts and goblins is almost over and I am happy to report that the real estate market is not a nightmare… on elm street. There is still a lot of crap on the market though, which is a large reason why the number of active listings is still quite high at 445 for all of Newmarket (all housing types), which is only up by 10 listings since the end of September. This is a very large number, especially when you compare this to the number of sales that have already been reported as SOLD Firm this month, which is currently (at the time of this writing) 104 sales. This means that of the 445 active listings, only 23.3% of listings have sold. The Average sale price of $760,213 is right in line with where prices have been Since around August of 2017, with a slight bump up in October/November of last year. For the most part, the average price has remained in the mid-high $700’s. There are currently 29 properties listed as Conditionally sold, with 19 of these having conditions due before the end of the month. SO, provided these do not fall apart, we could see a large number of sales reported this month. 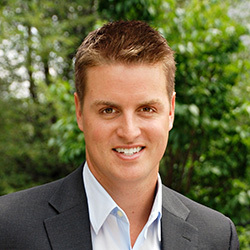 * Buyers, don’t hesitate to act on a property. There are several homes selling well under the asking price. * Sellers: Be careful with your list price, especially this time of year as we only have a handful of selling weeks left this year before things really slow down for the holidays. It’s very encouraging to see the sales figures for June picking up in Newmarket. At the time of this writing, there have already been 107 sales reported this month, of all housing types, with an average sales price of $783,697 (median price of $722,500), and a few days left to add to that number. It’s also encouraging for home owners to see that the average price has jumped up by roughy $45,000 from May, as there have been 16 sales reported sold for more than $1,000,000. Looking forward to seeing what the numbers close out the month with. 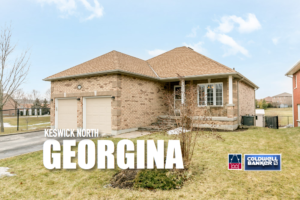 When it comes to Real estate in Newmarket, Ontario there is certainly a trend that has been going on for the past year, which is a huge disparity between active listings and actual unit sales per month. 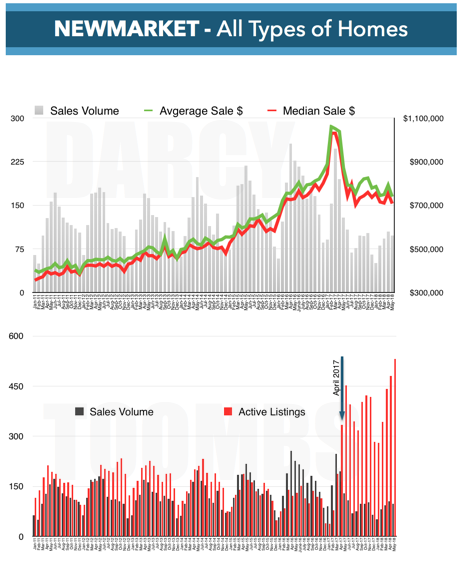 From the lower graph, you can see that the shear level of active listings reported at the end of each month is far greater than any year previously reported. These figures go back to January 2011, where you can see it was a pretty stable up and down in listing volume, depending on the time of year, and the sales seemed to also follow a similar pattern… until April 2017. April 2017 was an extraordinary month in GTA, and Newmarket Real Estate, as it was the culmination of several things, which hit the market hard. The Liberal Government announced the Foreign Buyer tax on April 20, 2017. While this was considered a small hit to a small number of buyers, but was also the exact date that most GTA Real estate agents will tell you the market stopped. Prices had reached an insane peak, increasing nearly 50% from 2016… which is obviously not sustainable. Several foreign nations had a surge of cash leaving their countries for the previous 12 months, like Iran & China, to place capital in markets considered much safer than their home markets. One can argue that the timing on the foreign buyer tax was ill advised, but the government was just trying to slow down the red hot market, to avoid a crash.. either way, we are where we are now, but a lot of things changed the day of the announcement. Word to the wise, don’t “try” a price to test the market… your first week on the market is the most important and if you price it wrong out of the gate, you lose the edge of being a new listing. Canadians’ collective household debt has climbed to $1.8 trillion as an international financial group sounds an early warning that the country’s banking system is at risk from rising debt levels. As well, Canada’s debt-service ratio, which measures interest payments and amortizations relative to income, is at 2.9 per cent. That surpasses BIS’ critical threshold on this measure of 1.8 per cent. Canada is one of five countries in the red on this metric, again along with Hong Kong and China at 6.9 per cent and 5.1 per cent, respectively. The debt-service ratio in both Russia and Turkey were also showing signs of risk, at 1.8 per cent and 6.1 per cent, respectively. how this affects the Newmaket real estate market has yet to be seen, as there is still a lot of good employment in the area, but it’s a troubling sign as to why the government is taking, what might seem to be, some extreme measures with regards to financing requirements. it’s harder to qualify for mortgages for many buyers which is a contributing factor for a decline in prices… as well as a switch from Sellers Market to Buyers Market. AS you can see from the numbers above, it’s really just detached homes which have seen the most significant slow down. what concerns me for my clients looking to sell and buy this year, is the number of new listings coming online, and the wave of new listings I am expecting in the coming weeks (after march break especially). Buy a home and then sell your home. SELL FIRST: You might sell and not have a home to buy… But, you will know how much equity you have coming out of your home and are in a VERY strong position when negotiating your purchase. Worst case scenario, you look to rent something temporarily, and continue looking for a home to buy… further downside to that would be prices to increase while you are renting and it becomes harder to buy something you really like. CONDITIONAL OFFER: You typically have to “buy” that condition, meaning you need to pay more than you would if you didn’t have a condition for the sale of your home, as the Sellers are not going to be as interested in a ‘conditional offer’, but you also have the least amount of risk in this scenario… provided the Seller i willing to play ball. BUY FIRST: When you buy before you sell, you are typically buying a home you really want, and are typically feeling like you are not settling for anything either, plus you can also typically negotiate a better price than if you had to make an offer that is conditional upon your home selling, but you will be in a MUST SELL position if you can’t carry both homes, which can be stressful, especially if prices are declining. 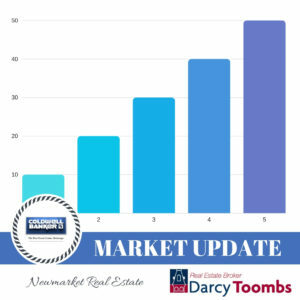 The biggest factor: Prices have decreased to the south of Newmarket, which means buyers who were forced north due to budget constraints last year can now buy in their preferred areas. 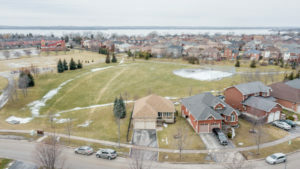 This will also be a big reason why I can also see communities like Holland Landing, Mt. Albert, Queensville & Keswick see prices also decrease. (Someone who has $800,000 to buy a large 4-bedroom home was somewhat forced to look to Keswick, but now can find a home in Newmarket for that budget, which may be preferable for their family lifestyle). Again, I’m not predicting a big decline in prices, but I also don’t expect the prices to spike up anytime soon either, unless it’s in a high desirable neighbourhood and the home shows extremely well. Time will tell if I’m right or wrong! Today is the last day of February. It’s been a slow month for sales in Newmarket, Ontario with only 78 total sales for all housing types. Now the month is not over yet, and there is certainly going to be more sales reported today, but this is a sign that the market has shifted and those looking to sell need to realize that as they will be competing with other new listings in the coming weeks that will likely be priced to sell. Looking for a bungalow in North Keswick? You better check this one out asap! 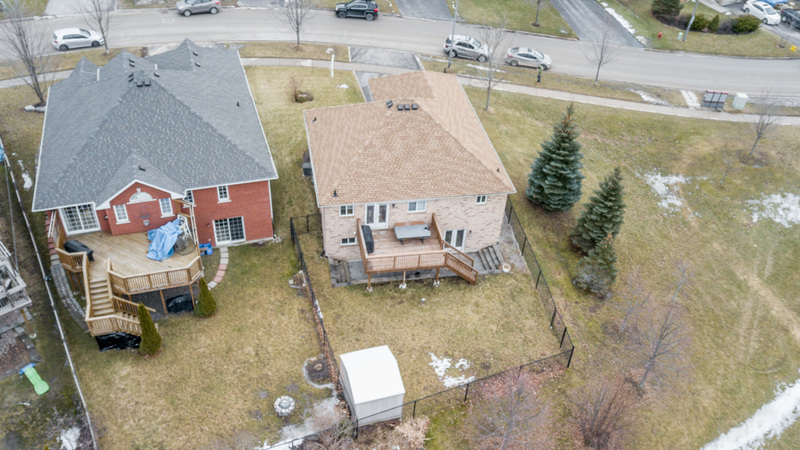 Listed @ $549,900, this home is expected to sell quickly as the demand for bungalows is still red hot… especially when they are in this condition! 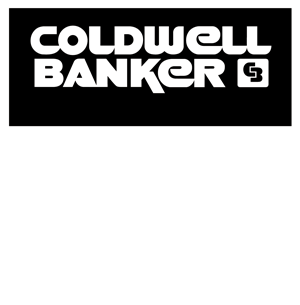 I am a real estate Broker with Coldwell Banker The Real Estate Centre, in the town of Newmarket, which is located about 30 minutes north of Toronto, Ontario, Canada. I love my wife, our dog and my town! Referred to as “Mr. Newmarket” by my friends, I love making sure friends, family and perfect strangers know how great a town we live in and try to get as many people involved as best I can with local events and charities. This blog is intended to help Buyers, Sellers, Tenants & landlords better understand what is going on in the local real estate market.